Hollywood is scared. Piracy is going to eat them. There is no real expertise on that field, no statistics or rules, but they are convinced: We rob them, we spoil them. They gave the mission of protecting HD content to Intel, the computer industry giant. Intel played a great role in the middle of the consortium who bring out : HDCP. The above already comes with a HDMI/HDCP output. They now require all other parts of the chain to also be HDMI/HDCP compatible in order to display anything in HD and Full HD. The drive, OS and Graphic Card on computer. Vista is now available, HD-DVD/Blu-Ray Drive and real HDMI Graphics cards are also available. The display means PC Monitor, HDTV, CRT, LCD, Plasma, Video/Retro projector. Many are technically able to display such resolution but are not HDCP compliant. It is surely HDCP compliant if you bought it after 2004 for HDTV and after 2005 for PC monitor. The protocols act like this: COPP Driver (Certified Output Protection Protocol) of the OS asks the firmware of the graphic card about its legitimacy. Once they agreed together the Graphic Card will ask the display KSV. An unique 40bits key that allow or not the output and display of 720p and 1080p HD signal. Any HDCP compatible product will clearly display its compliance, written “HDCP Ready” or through a HD Ready logo. To be HDCP compliant means the use of a numerical interface. Only product with DVI/HDMI Inputs and Outputs could claim to be HDCP compliant. 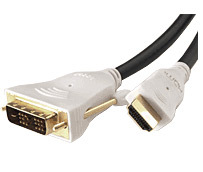 HDMI is basically a DVI + sound + HDCP. The fact that a device HAS a DVI interface does not automatically mean that it’s HDCP compliant. This is exactly why there is a real upcoming nightmare for all existing screens and displays that are technically able to display 720p or 1080p but do not have HDCP. There are millions of screens and displays that the industry would like to be thrown away from your living room even if some are still technically superior. You just bought a brand-new Euro PS3 and you don’t have a HDTV which is HDCP compliant at home. You may think that your PC monitor is able to display 720p or 1080p and you will probably try to hook up your PS3 this way. No Chance, Even if your display is technically able to do it, you will get a BLACK SCREEN through the HDMI output of the PS3, and no Full HD 1080p through the A/V port. The Goal of HDCP: Unable to copy movies at 1080p ! For this reason, the industry decided that all screens available in the world before they worked out their protection would have to be replaced at the customers expense.